Abstract: Image guided techniques are necessary to identify and target intra-abdominal lesions for biopsy. CT and ultrasonography (US) are the imaging modalities most often used for this procedure. 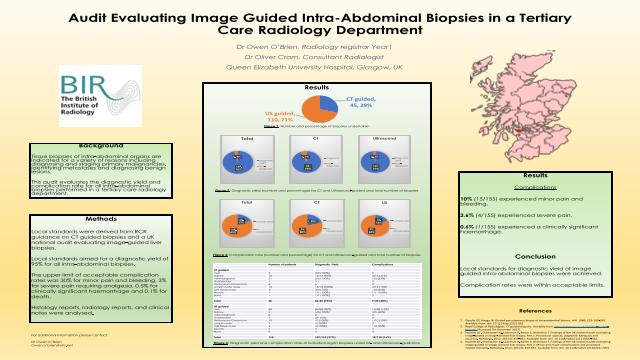 The aim of this audit was to evaluate the diagnostic yield and complication rates for all intra-abdominal biopsies performed in a large teaching hospital radiology department over 10 months. Standards were derived from RCR guidance on CT guided biopsies and a UK national audit evaluating image-guided liver biopsies. A local standard that 95% of all intra-abdominal biopsies should have a diagnostic yield was set. Complication standards included 30% for minor pain and bleeding, 3% for severe pain requiring analgesia, 0.5% for clinically significant haemorrhage and 0.1% for death rate. Histology and radiology reports, and electronic patient records were analysed. 96% (149/155) of biopsies taken had a diagnostic yield, 93% (42/45) of CT guided and 97% (107/110) of US guided. 10% (15/155) experienced minor pain and bleeding and 2.6% (4/155) experienced severe pain. 0.6% (1/155) experienced a clinically significant haemorrhage. No directly attributable deaths were identified. Kidney biopsies had a comparatively large complication rate, both under US 60% (3/5) and CT guidance 31% (4/13). Results show achievement of local standards for diagnostic yield of image guided intra-abdominal biopsies. Ultrasound had a higher diagnostic yield than CT.
Future audit will evaluate a larger patient sample to give a more statistically accurate representation of rare complications. Summary: Audit Evaluating Image Guided Intra-Abdominal Biopsies in a Tertiary Care Radiology DepartmentReferences: 1.Gazelle GS, Haaga JR. Guided percutaneous biopsy of intraabdominal lesions. AJR. 1989; 153: 929-935. Available from: doi: 10.2214/ajr.153.5.929. 2.Royal College of Radiologists. CT guided biopsies. Available from: https://www.rcr.ac.uk/audit/ct-guided-biopsies [Accessed 7th December 2017]. 3.Howlett DC, Drinkwater KJ, Lawrence D, Barter S, Nicholson T. Findings of the UK national audit evaluating image-guided or image-assisted liver biopsy. Part 1. Procedural aspects, diagnostic adequacy and accuracy. Radiology. 2012; 265 (3): 819-831. Available from: doi: 10.1148/radiol.12111562/-/dc1.